"This has become a favorite--easy but unique. Can be served hot as a main dish, or or cold as a pasta salad." Cook pasta in a large pot of boiling salted water until done. 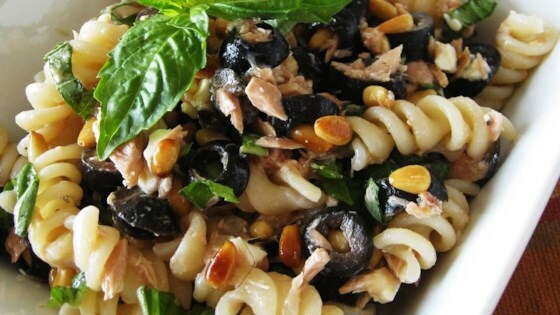 Meanwhile, mix together tuna, olives, pine nuts, garlic, parsley, basil, and crumbled feta cheese. Drain pasta. If you are serving it cold, then rinse with cold water until chilled. In a large bowl, toss pasta with lemon juice and olive oil. Stir in tuna mixture. Serve hot, or chill for about 1 hour before serving. See a pasta dish that's based loosely on a classic diner lunch combo. This recipe is amazing! I served it warm, and did double the feta and olives, and used less pasta (about 3/4 lb). I understand it was even better cold the next day. This was great! You can also use shrimp that is quickly sauted in some oil and garlic instead of the tuna. This dish was delicious and not hard to make at all. I don't often make the same recipe twice but I would definitely make this one again!